This week I finished reading Scott Hahn’s Joy to the World: How Christ’s Coming Changed Everything (and Still Does). It’s a good devotional read for the Advent/Christmas/Epiphany seasons, especially for its deep dives into traditional Christian interpretations of the Christmas story. And what of the star? John Chrysostom may have been pre-scientific and pre-critical in his thinking, but he wasn’t stupid. 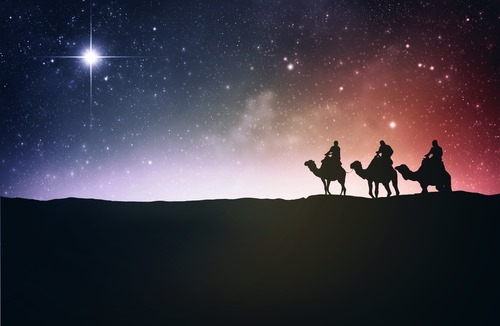 With John Chrysostom I have to conclude that an angel appeared to the Magi as light and led them to true worship—which, as I’ve said before, is what angels were created to do. Key for me is this sentence: “Chrysostom may have been pre-scientific and pre-critical in his thinking, but he wasn’t stupid.” For some of us, we need that basic fact: he wasn’t stupid. For others of us, it’s not that we think people of the past were stupid, but rather that we assume they were ignorant. “Pre-scientific” means that Chrysostom didn’t understand the motion of celestial bodies as well as we do. At the same time, Chrysostom’s view of reality was larger than many of ours. He had room for the observable and empirically measurable as well as room for things beyond those categories. I hope I have room in my life and my outlook for things that don’t make sense. I hope I don’t have an explanation for the glory of God. I hope that sometimes I can still experience wonder and worship and lead others to worship—which is what humans were created to do.